Tropicália: A Brazilian Revolution in Sound. Tropicalia is one of the most significant cultural movements in Brazil encompassing music, film, visual art and theatre. To check out the amazing Barbican Tropicalia exhibition that is currently running alongside our Tropicalia album go to www.barbican.org.uk/tropicalia 'Tropicália' is the first album to bring together all the key artists involved in the movement – Os Mutantes, Gilberto Gil, Caetano Veloso, Tom Zé, Gal Costa and more. The Tropicália movement was born in 1968, a momentous year around the world. It was the year of the Martin Luther King and Bobby Kennedy assassinations, the Prague Spring, the Chicago Convention, the Tet Offensive in Vietnam and the anti-war movement, the student rebellion in France, civil rights, the beginning of the end for the Soviet Union and the birth of the women's movement. In Brazil, army violence that killed three protesters in the opening months of 1968 failed to keep students from protesting the four-year-old repressive Brazilian military dictatorship. It was against this extraordinary backdrop that Tropicália arrived. As a coherent movement allied to worldwide political and cultural unrest, Tropicália lasted little more than a year, yet it had – and continues to have – a profound effect on Brazilian society. Mixing psychedelic rock, avant-garde musique concrete (tape loops, sound experiments), samba, funk and soul, Tropicália was so radical – and its social implications so politically profound - that its leading protagonists, Caetano Veloso and Gilberto Gil, were arrested, imprisoned and finally exiled in 1969. Tropicália's unique ideology mixed high art with mass culture. 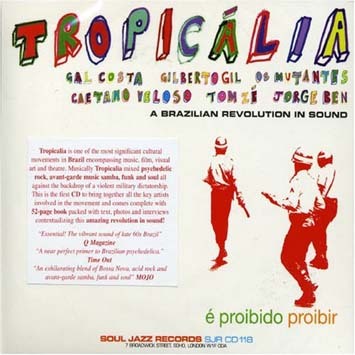 Tropicália created musical and cultural anarchy, a revolution in Brazilian sound with a legacy later to be internationally championed by such diverse artists as David Byrne, Beck, Kurt Cobain, Stereolab, The Bees and Tortoise. Tropicália artists loved the Beatles and Jimi Hendrix. They loved such forgotten Brazilian musical radio heroes as Dorival Caymmi, Luis Gonzaga and Orlando Silva as much as they were interested in the avant-garde of John Cage and Stockhausen.